Napoléon, Louis XIV, Ramsès II, Grant...Figurines et histoire, wargames pour de nombreuses époques jouées. 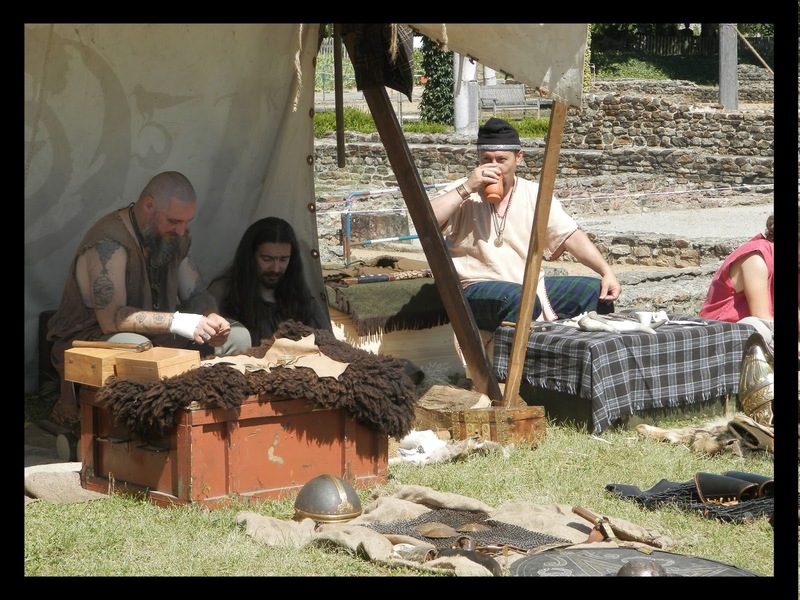 Morning of the first day, the fighters take a little rest before the furnace. Matin du premier jour, les combattants prennent un peu de repos avant la fournaise. Le camp a été établi pour deux jours, sous un soleil de plomb. 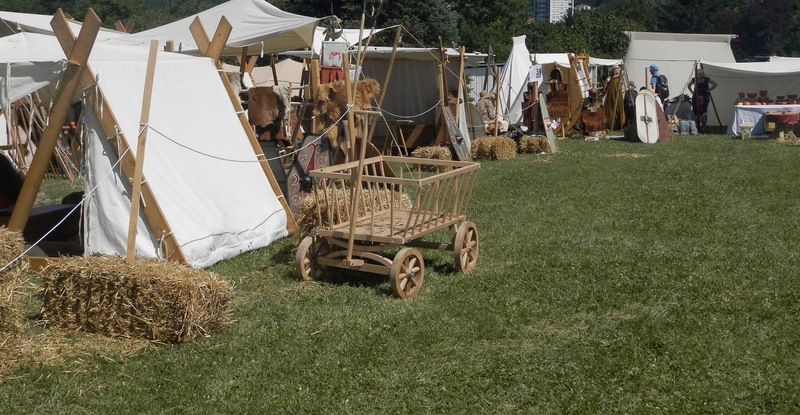 Under a blazing sun, camp was established for two days . Hommes et femmes se protègent donc du soleil non loin des rives du Rhône. Men and women protect themselves from the sun near the banks of the Rhone. On the banks of the Rhone where everything seems calm . Les domi sont sereines grâce à la Pax Romana. Due to Pax Romana, homes are quiet. Chacun vaque à ses occupations quotidiennes. Everyone goes about his daily business. Nouvelle participation aux journées Gallo-Romaines de St Romain en Gal près de Vienne. On s'y retrouve avec grand plaisir, dans un lieu chargé d'histoire. Cette année le thème des reconstituteurs est 'Les Gladiateurs'. Pour nous, en figurines, ce sera Pyrrhus. Alors après les figurines du musée, voici les nôtres. 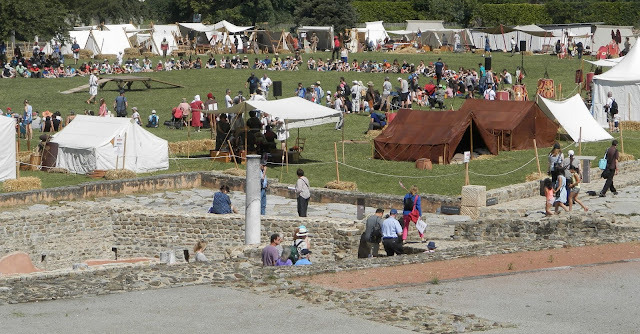 New participation in the Gallo-Roman days of St Romain en Gal, near Vienne. We go there once again with great pleasure, in a place full of history. 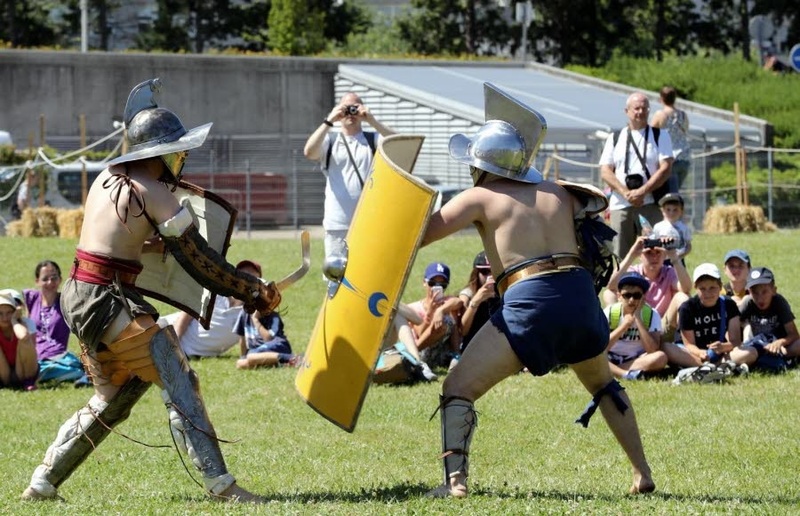 This year the theme of the re-enactors is 'The Gladiators'. For us, in figurines, it will be Pyrrhus. So after the minis of the museum, here are ours. Préparation donc de la table avant l'arrivée des spectateurs, entre mosaïques et découvertes archéologiques...Un écrin magnifique pour notre hobby! 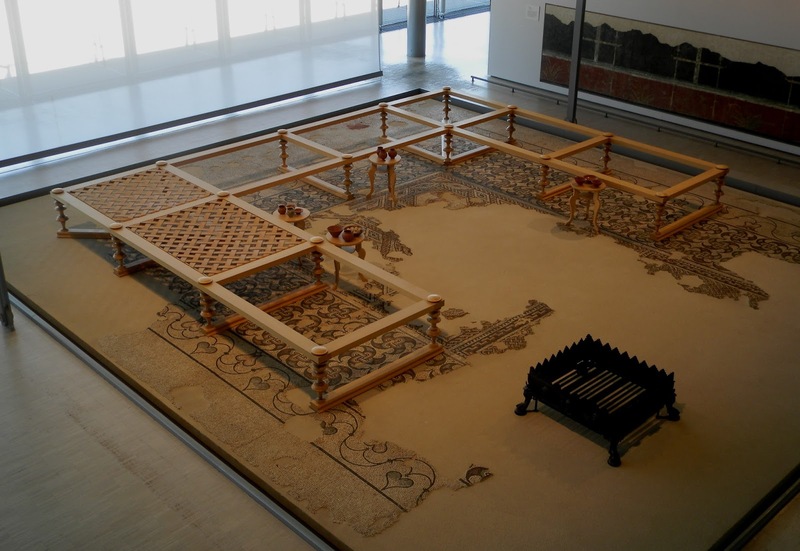 Preparation therefore of the table before the arrival of the spectators, between mosaics and archaeological discoveries ... A splendid case for our hobby! Pour nous aussi les camps sont prêts, le repos avant la bataille. Also for us camps are ready, rest before the battle. Et bientôt l'armée de Pyrrhus se déverse sur les vertes plaines d'Italie. Pyrrhus ad portas! Soon the army of Pyrrhus poured over the green plains of Italy. Pyrrhus ad portas! Où sont déjà disposées quatre légions romaines en quinconce. Where are already staggered four Roman legions . Ouverture des portes, l'affrontement va pouvoir commencer. Doors open, the battle can begin. Les premiers spectateurs arrivent dans les salles, ici une démonstration d'instruments de musique. Cythares, flutes et ascaules au programme. The first spectators arrive in rooms, here a demonstration of musical instruments. Cythares, flutes and ascaules on the program. Ici un salon d'essayage de toges et autres drapés gallo-romains. Here a dressing room of togas and other Gallo-Roman draperies. A l'extérieur, entre les tentes et les vestiges gallo-romains, des groupes se forment pour assister aux représentations. Thraces, mirmillons, secutors, rétiaires...tous se présentent au public avant de s'affronter. Thraces, mirmillons, secutors, rétiaires ... all are shown to the public before confronting each other. Certains après avoir été littéralement aveuglés, tradition sinistre que je ne connaissais pas. Ils se repèrent à l'aide de clochettes qu'ils agitent. Some after being really blinded, sinister tradition that I did not know. They find themselves by waving bells. D'autres utilisent une méthode plus classique, Vae Victis! Others use a more classic method, Vae Victis! ...Où piques et éléphants affrontent les légions romaines, l'issue est incertaine. ... Where pikes and elephants confront the Roman legions, the outcome is uncertain. Dernières déambulations sur les voies romaines en fin d'après-midi, on y croise des légionnaires accablés par la chaleur. Le soir venu, casques et boucliers sont posés, les combattants sont fatigués. In the evening, helmets and shields are laid, the fighters are tired. Alors petit à petit l'intérieur du musée retrouve sa quiétude. mais c'est une autre histoire! That must have been a great event! We enjoyed it a lot...but not the heat! Stunning photograps both of the reenactors and the wargame. Ah ca me souviens quand j'ai participé dans une de cettes activités avec ma legion (http://usuaris.tinet.cat/masefe/cat/legio01.html). C'etait un site prés d'Arles avec des dolia sousterrains pour la fermentation du vin. Great pictures. The event seems quite interesting. Great report Phil ! fantastic mini's & interesting photo's ! I'm looking forward to your next report ! Very neat event you all took part in. Thanks for sharing all the pictures! What a splendid event to be part of, and what a wonderful place. Your game and figures certainly held up to the quality of the setting. Thanks for allowing us to enjoy it via this well done (as usual) report! Фил отличные фото. Прекрастный фестиваль! The mages of the show were very nostalgic for me. I used to be a member of "The Dark Ages Society" and we did these re-enactment events (and banquets) all over Britain, back in the late 80`s and early 90`s (we actually did many of the fight scenes in the "Robin of Sherwood" series). What a great looking event, Phil. Thanks for posting. And thanks for commenting Mark! What a brilliant setting for two days of historical fun, I'm very jealous Phil. Looks like a great ancient event! It was fun to share our passions indeed! Thanks, the Riflemen's 2-for-1 coverage of the events was fun. Beautiful and interesting post, Phil! Terrific event and a grand day out! Thanks, Phil! Thanks for your sweet comment Evan! Great event and superb figures Phil! Pikes, legions and elephants...always impressive! Awesome, what a great way to show our hobby! Looks like a fun day, and worthwhile to be involved. Such a themed event must have been amazing. Good to see there was room for a lot of aspects of hommage, including a battle table. Thanks a lot for the pictures! Très intéressant et bel exemple de ce que le jeu d'histoire peut apporter au public. Bravo à vous et aux reconstituants. Merci beaucoup...ceux qui étaient à l'extérieur sont bien plus méritants vue la chaleur qui régnait! Impressive looking table and game in an impressive environment - thanks for sharing! Hé, I thought I saw Russel Crowe, but not sure! so so SOOoo good, it made me want to be there with you all - live. I`d have stayed with the game table and watched the whole game from start to finish too. A lovely setting for a lovely looking game, does look a bit hot! Very very hot, you're right! Looks a great way to spend a couple of days Phil - lovely figures as always! It looks like great fun event. It is amazing when you have a wargame and small scale and just beside you the same, but in real size. Cheers Bart, I did not take pictures of it but the funniest was when reenactors were looking at the table with their real weapons and shields...impressive! une belle journée sous le soleil!..les "conventions" reconstitutions sont rares! Merci l'ami, c'est vrai que quand on arrive à en faire 3 dans l'année, c'est déjà un bon chiffre! Your kind words are much appreciated my friend! Wow ... what an amazing way to immerse yourself in history! Thanks for sharing. And thanks for visiting, much appreciated! Wow! Can't believe I missed this post earlier, Phil. What an amazingly cool event. Good to see the hobby represented there with your fine work too. Very cool...wish I could've been there. This kind of event is truly impressive, and rich in encounters...may be one day! A very good time for us, thanks a lot! Wow. This looks like fun! Love your gaming table. Riflemen's You tube is here! Vous êtes intéressé par...cliquez! Interessed in....Click ! Merci à vous tous pour ces récompenses! 1347, Pour qui sonne le tocsin...1347, For Whom the Tocsin Tolls. Hoe the sails!...Hissez les voiles! 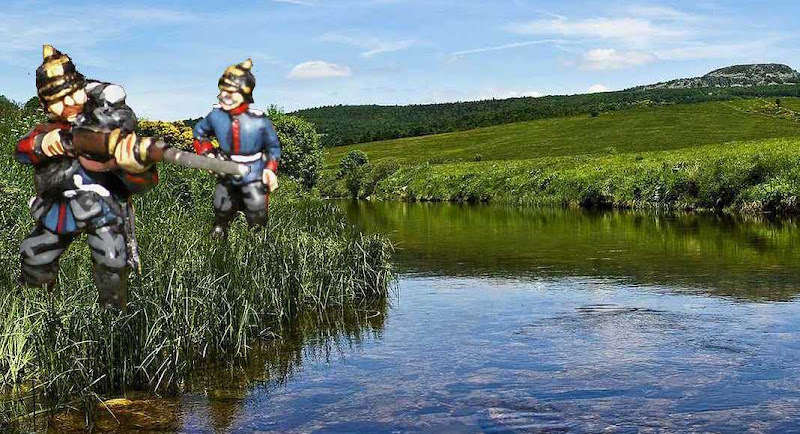 September 1914, a peaceful river...Sept 1914, une rivière paisible...Семь 1914 года, мирная река. Click to look at the rules. Blog list , A to L.
une nouvelle base pour mon siptfire - j'ai trouvé des cadres en bois pour pas grand chose dans un magasin de jouet et articles créatif. Stryker base done. - Ho finito il lavoro sulla basetta dove posizionerò lo Stryker. I finished the work on the base where I will place the Stryker. - Наблюдательный пост с кордегардией. The Id, grey aliens - Lucid Eye Id. Necromancer and his Zombies - Just finished this little group of freaks. The Zombies are made by Mantic and the Necromancer is a Games Workshop miniature. Cajas - Realizadas en madera. Blog list, M to Z.
S-Model 1/72 Hotchkiss H38/39 Light tank - 一直都是人形和飛機, 花一點時間確認一下還會不會做戰車... 說明書很簡陋,沒說是哪種綠色. 不過我也不在意,反正是自己玩的. 我很喜歡這種小戰車,看起來很可愛. S-Model設計的不錯,組裝簡單. 但是用了太多蝕刻片,反而與最初的理念背道而馳.